The date is September 18th 19th 20th. Prices held from 2014 – superb value !!! Usual impressive line up of top notch DJs covering all aspects of modern soul, jazz, house & dance music in 2 fantastic rooms with top quality sound systems in both. Tell us your room requests (names, number of people telephone contact etc.) & we will allocate you a room number & a booking form straight away back to your email address. You then contact the hotel & quote this room number to pay your deposit of £20.00 per person to secure the room or pay the full amount if you wish. It has to be stressed that all deposits are "non-refundable" & the full balance to The Langdales MUST be paid by July 31st 2015. Any rooms not paid for in full by this date will be offered to other people. £75.00 per person to the hotel. £20.00 per person payable upon arrival for a wristband for the whole weekend. Total of £95.00 per person. All the usual meals are included - 2 breakfasts - Saturday & Sunday & 1 evening meal on the Saturday. The music sessions will go on even longer this year. Full use of the pool, gym, Jacuzzi as always, is included in the price. Any person booking a double room with "single occupancy" will have to pay a surcharge of £10.00 per night. I must advise everybody that rooms are being snapped up already. There will, of course, be "non accommodation" passes available at just £20.00 for the whole weekend for those not wishing to stay at The Langdales. Please do not leave it too late to book - it will sell out !! 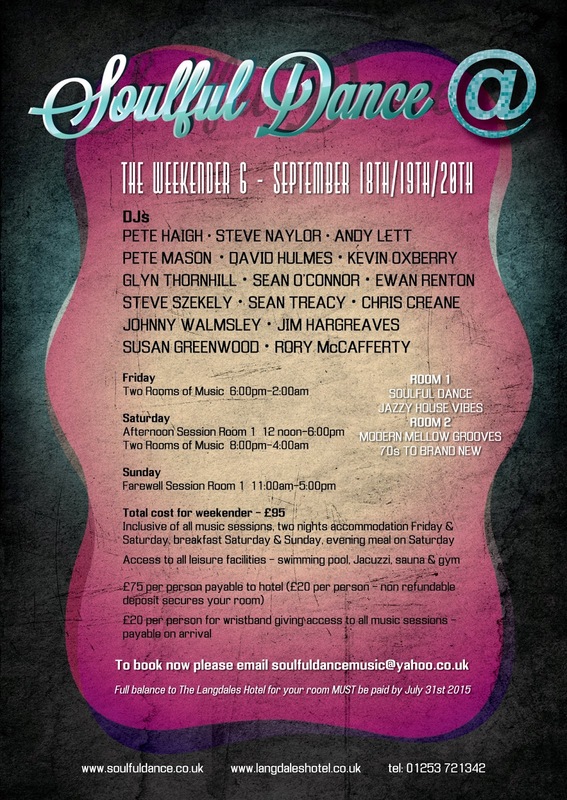 If you enjoy modern soul & dance music in a warm, friendly & relaxed atmosphere then "The Weekender 6" is where you want to be !! !